We are pleased to announce that we are now officially offering surveillance systems for both home and business. Logistics’ state of the art security systems allow home/business owners peace of mind when it comes to protecting their property by allowing user to monitor their home or business from virtually anywhere in the world. With virtually unlimited possibilities users can view and monitor their property from any computer with internet connection or even their cell phone. 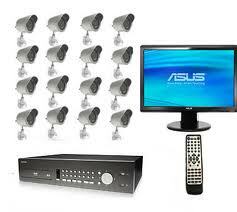 Logistics offers 4, 8 & 16 channel security systems. Cameras are weatherproof can be used indoors or out have night vision. Each system comes with a 1TB State of the Art DVR with a long list of features including DVD burner, raid capability for up to 3 hard drives, email notification, VGA output, web server with TCP/IP Network Access, file export & multi level user access. User can watch camera footage in real-time at 30 frames per second per camera or playback at a later date. DVR keeps up to 2 weeks of data at a time. Watch footage from a monitor, computer or a cell phone at your convenience. Every business/home has different needs. Our experienced technicians will visit your home or business and help pick out a system that is perfect for you. Stop by our showroom at 361 Boston Post Rd in North Windham- located across from Walmart in CG Real Estate and see our systems. If you are interested in seeing one of systems in actions we can also arrange an appointment to see one of our systems live at a local business. Call us at 860.942.8522 if you have any questions or set up an appointment today!